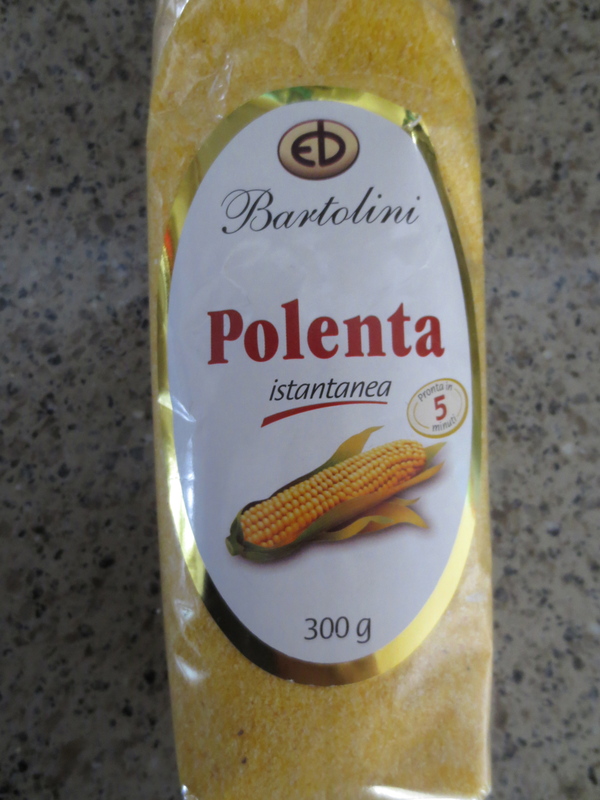 Writing about the maize for polenta growing in the fertile plains of the Po Valley in Northern Italy in my last post set up a longing for some polenta. Polenta is a relatively new love of mine. My first experiences of it were of glutinous and tasteless lumps that didn’t inspire me to cook it myself. 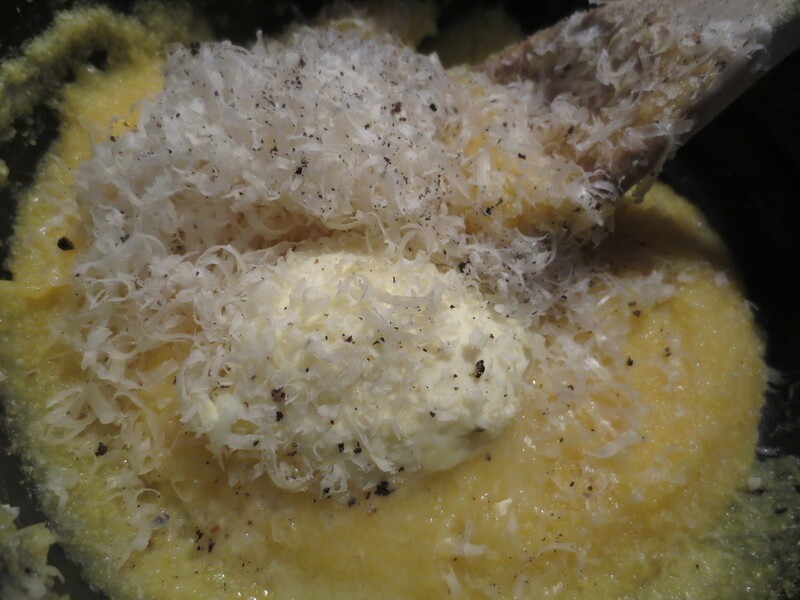 It was a Skye Gyngell recipe, beating the corn mixture with lots of butter, grated Parmesan and seasoning into a creamy mound that changed my mind about how good polenta could be. Since then I’ve served it Hunter Style – Polenta alls Cacciatora, with sausages and sometimes as an accompaniment to a rich beef stew instead of potato. It also makes wonderful cakes – like Lemon Polenta Cake – giving the cake a gorgeous grainy texture, full of taste. Learning that ‘grits’ in America are the same as polenta was a recent discovery. When I watched all those films of the Wild West as a child and people talked about eating grits I thought it sounded disgusting. Well if you’re a London kid, it would. Our kind of ‘grits’ aren’t nice and not something you’d eat. I have to say that, like many, many things, the dish definitely sounds better in Italian; polenta has nice round, softened, musical note to it. 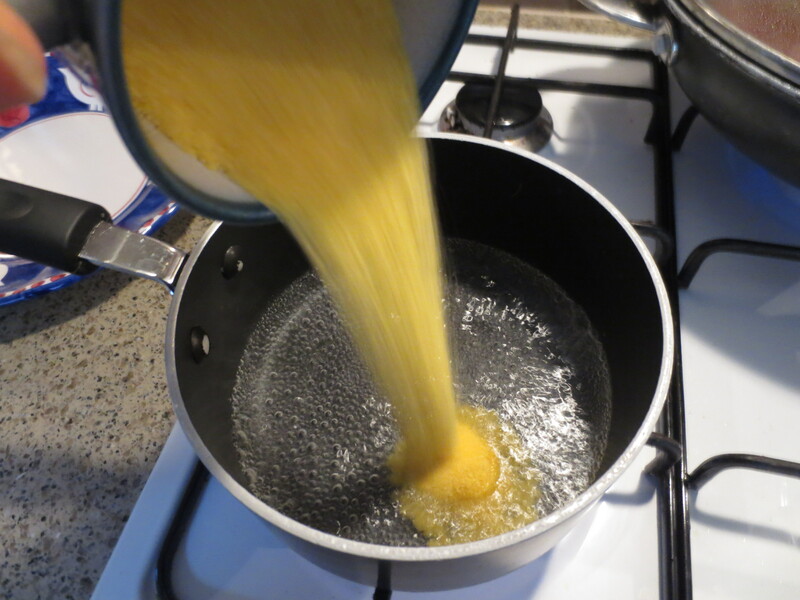 Polenta dishes are mostly found in Northern Italy and first became popular in the Veneto and Friuli. 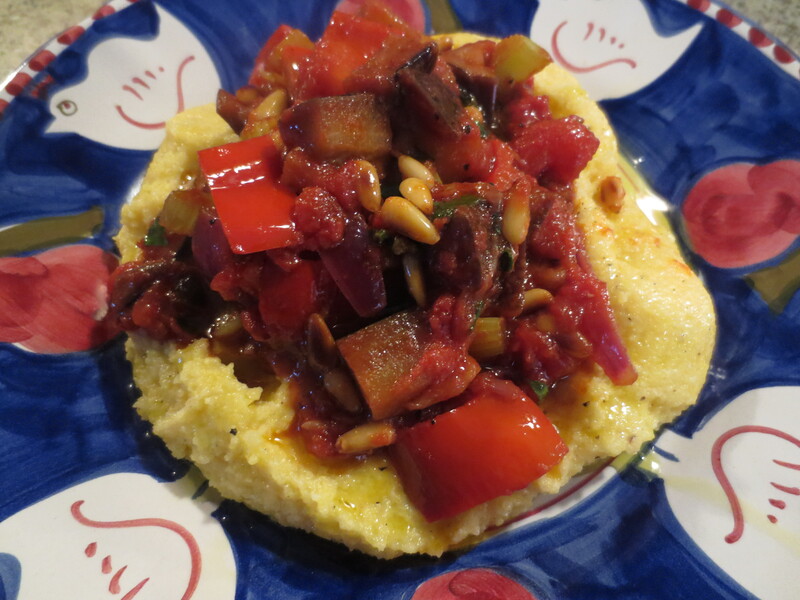 Until maize was imported from the New World in the 16th century, polenta was made from spelt, millet and chestnuts. Historically, it’s peasant food, a good way to make a little go a long way and bulk out a meal. Nowadays it has a more sophisticated story. It’s commonly served in Venice with dishes like Fegato alla Veneziana – calves liver cooked with onions – and a white form is made from special maize and topped with wonderful Baccala Mantecato – a creamy mix of salt cod. I usually buy my polenta in Carluccio’s. I like a lot of their things, always buying my orecchiette, trofie and risotto rice there. I buy the ‘instant’, quick-cooking kind because, well, why would you make life more difficult for yourself than you need? I resisted all temptation to buy anything to make a sauce on the way home. Sometimes I buy specially for the blog. Maybe I’ve come across a recipe in a magazine or a new book; sometimes I search for something new to try. But sometimes my cooking is just like any other person’s: I look to see what’s in my fridge and needs using up. My fridge contained an aubergine left over from my Greek cooking at the weekend, some red peppers, pine nuts stored in a jar (best way to keep them as they go rancid quickly) and too few tomatoes for a sauce so it would have to be a tin of tomatoes. Well the sauce would definitely contain aubergines and tomatoes (always a winning combination) but what else, if indeed anything else, other than some onion. 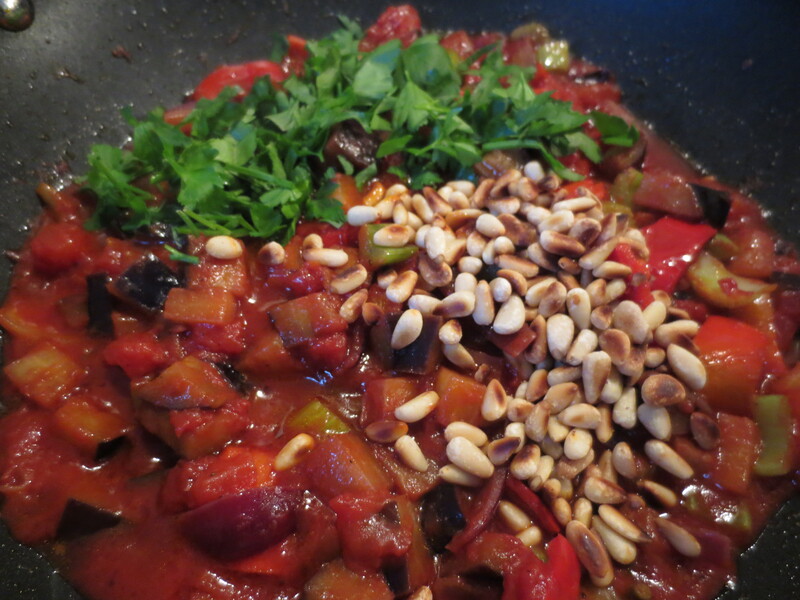 Thoughts of caponata ran through my head but while I didn’t want to go for the sweet and sour effect, I did fancy adding some pine nuts and also some celery. There were two heads of celery in the vegetable drawer of the fridge. I prepared the sauce first. I sliced a red onion with – rather than against – the grain and started frying it gently in olive oil in a pan. 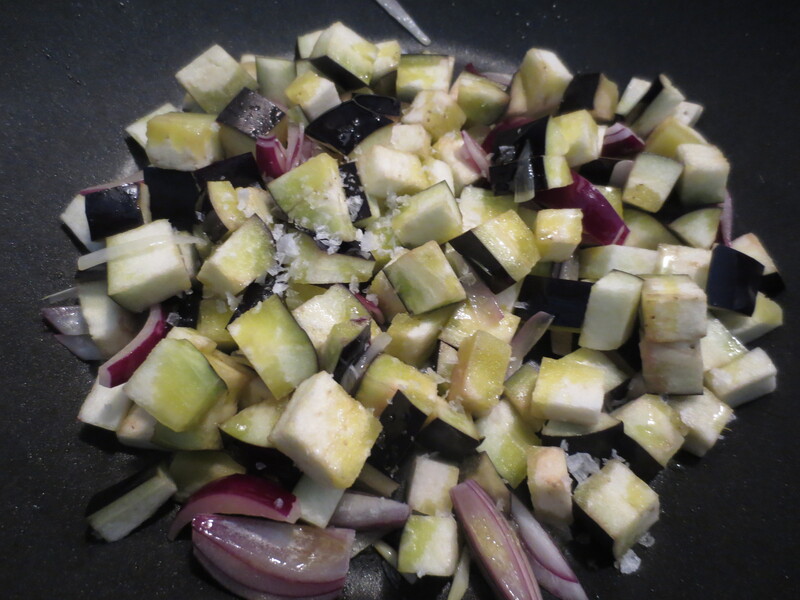 I diced the aubergine and added that with some sea salt. 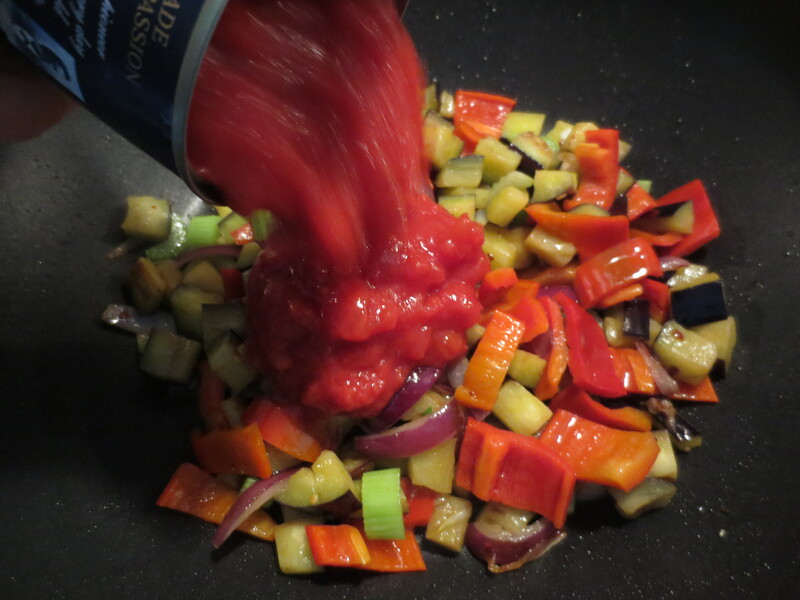 Added a little more oil as there wasn’t enough and cooked, stirring, until the aubergine started to change colour and soften. Then I added a chopped red pepper and 2 sticks of celery chopped. I stirred and then decided to add a large pinch of dried chilli flakes. I love chillis in nearly everything. I get through jars of chilli flakes faster than anything. Then I tipped in a 240g tin of chopped tomatoes. 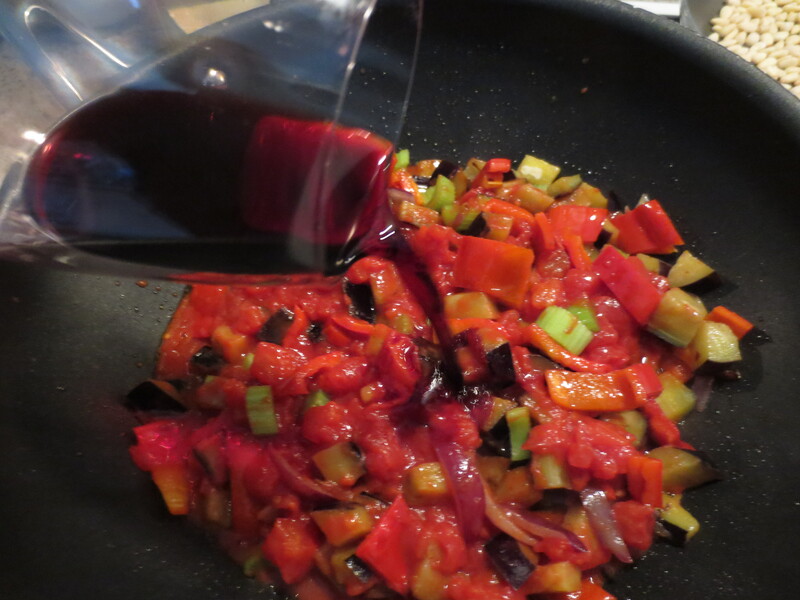 I gave this a good stir and then added a good glug of red wine – mainly because I had a bottle open but knew it would add a deep richness to my sauce. I brought to a simmer and cooked the sauce gently for about 5 minutes. Meanwhile, I toasted a handful of pine nuts in a dry pan and chopped a handful of flat-leaf parsley from my garden. I cooked the sauce gently for about another 10 minutes while I prepared the polenta. I brought a cup of water to the boil with some salt in a small pan. As soon as it started simmering I slowly poured in half a cup of the polenta. I beat well to make the mixture smooth. Then I added a large lump of butter and good grating of Parmesan with some freshly ground black pepper. I mixed it all together well until I had a nice smooth, creamy mixture. If you find it’s too thick, you can always add a little boiling water to loosen it. Then I transferred the polenta to a plate and smoothed it out with a dip in the middle to take the sauce. I piled spoonfuls of the sauce on top. There was lots of it and certainly enough for at least one more meal, so I’ll freeze that portion. Then it was ready to eat! And it was SO good. The polenta with all the seasoning and Parmesan makes a gorgeous creamy base for a sauce. The sauce was rich and full of flavour. I’d cooked it so the aubergine was cooked through but the celery and pepper still had a slight bite to them and then of course there was the sweet crunch of the pine nuts. For a meal of leftovers from my fridge … well, it had worked out pretty fantastically! Thank you Francesca. Well it was a bit wintry here again yesterday so it was just the kind of dish I needed and was really delicious too. Polenta is such a satisfying dish, especially when it is served with such a delicious sauce like yours. Thank you Gerlinde. The weather has been bad again with strong winds … something warm and comforting for supper felt right! Thank you! I had to google that but sounds good so will give it a try.